Make sure your television is working properly and that your flat panel installation is done right with Virginia Electronics. We have more than 30 years of electronics repair experience. Don’t let your kitchen or other critical home system hold you back. Our appliance repair, HVAC duct cleanings, and dryer vent cleanings make sure you get the most enjoyment out of your home. 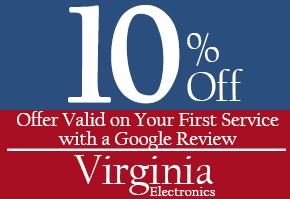 Keep your TVs and appliances running smoothly with high-powered electronics repair by calling Virginia Electronics in Ashland, Virginia. From television and appliance repairs to installations, our skilled technicians are always on the lookout for our customers’ best interests. Whether you need satellite system installation, dryer vent cleaning, or HVAC system and duct cleaning, our services are equipped to handle all models and brands. We are a reliable company that currently runs 65 service calls a day. We also do extended warranty work for Lowe's™, Sears™, Home Depot™, HH Gregg™ Best Buy™, and Warrantech™. We look forward to hearing from you. Contact us by phone, email, or the form to the right today!